I have too many blogs! Now that I'm co-ordinating the Barnsley War Memorials Project I seem to spend more time on that blog than my own. I have often said that writing a story about my family history research makes it easier to put all the pieces together in order and to see where the gaps are. So this post is being written for exactly that purpose. I may not publish it straight away or I may not include everything I know - I am hoping that I might be able to interest Memories of Barnsley, a locally produced history magazine in the tale. But at least writing some of it here first will let me work out how I want to begin this story. Adding a Facebook page to the social media arsenal of the Barnsley War Memorials project may not have been popular with everyone, but it is attracting a good few 'like's and so far three submissions from family members about their WW1 Soldier ancestors. One lady managed to find me in an even more convoluted way ... she backtracked through my family history pages, to my husband's Barnsley CAMRA website and phoned my mother-in-law! 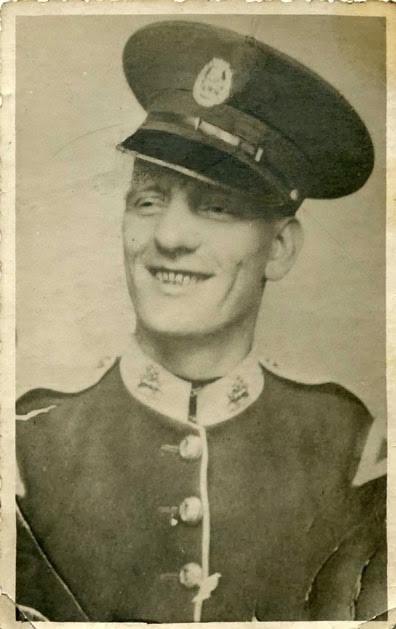 JB (I don't use full names on my blog unless I've checked with people first or they are in the public domain already) told my mum-in-law how she'd found an old photograph, with a postcard style back, in a book in a charity shop in Retford. She wasn't that interested in the book, "Decisive Battles of the 20th Century Land-Sea-Air", but for 99p she bought it to get the photo. There is some writing on the back, part of an address, and this enabled JB using her family history skills to track the man back to Gawber in Barnsley. It read, "A Lloyd, 52 Nilhdale Place, Gawber, Barn ..." and then it fades away. There is no stamp or any message, just that partial address. JB tracked an Albert Lloyd to Gawber in the 1911 census and found that there was a Nithdale Place there too. She also found a Harry Lloyd on the Gawber War Memorial , and worked out that Albert had had a brother called Harry. It was at this point she tried to get in touch with me, as she doesn't live locally. She would ideally like to re-unite the photo with a member of the family. Since then I've done a bit more research on Harry, enough to confirm that this photograph is almost definitely him. But I'll save that for Memories of Barnsley if you don't mind! Harry Lloyd is dressed in the scarlet uniform of a bandsman in the York & Lancaster Regiment, as was I in the 1960s. The York & Lancaster museum confirmed that the uniform was in use during the period we think Harry was in the regulars - 1901 to 1909. Could they have retained the pattern for use by bands afterwards?